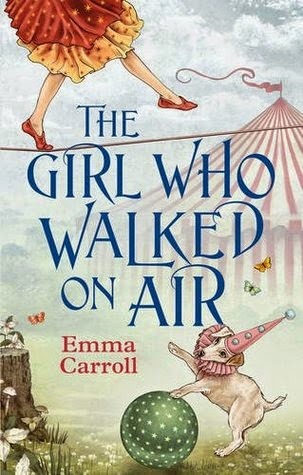 I absolutely adored The Girl Who Walked On Air by Emma Carroll. This is Emma Carroll's second historical story aimed at a middle grade audience but it is the first book of hers I've read. I'm sure I'll go back and read Frost Hollow Hall based on the strength of feeling I had for this book though. I absolutely loved the main character, Louie, and witnessing her journey throughout this book. She goes on such an adventure! And I definitely think my favourite aspect of this book is Louie's determination to succeed and follow her dreams despite everyone around her telling her that she can't because she's young and a girl. But things aren't all smooth sailing for Louie. As a baby, Louie was abandoned by her mother and taken in by Jasper, a trapeze artist at Mr. Chipchase's circus. Louie has grown up to become a ticket-seller and mender-of-costumes but she dreams of being a show-stopper, she dreams of being a tightrope-walker. Together with her lovely little dog, Pip, she's been training for years to hone her craft in order to impress Mr. Chipchase. But he doesn't seem to take her any notice at all. And instead the first of two strangers enters her life and changes things all around. I loved all the details that Emma Carroll wrote into the story about Victorian circuses and how every act needed the WHIFF OF DEATH in order to be widely entertaining and how every act needed to be daring and pushing the limits and taking things one step further to be truly death-defying and amazing. And Louie definitely gets pulled into this mind-set and idolises other risk-taking tightrope-walkers like Charles Blondin even after a horrible accident leaves the person closest to Louie in a terrible state. It felt exciting to read about all the risks and daring that these performers get up to, but also really scary that a balance hadn't been set. Other than Louie herself, I really loved all of the secondary characters in this book. Jasper, Mr. Chipchase, Pip, Louie's best friend, Ned ... even Kitty, Louie's arch-nemesis was a really entertaining addition to the story. But for me, it was Louie and Gabriel, a performer from another circus who comes to audition for the role of showstopper that really took the limelight for me. I loved how we are able to see Louie's courage next to Gabriel's nervousness and stage fright and how we slowly discover how Gabriel came to feeling this way. There were several really emotional scenes during The Girl Who Walked On Air and I felt slightly surprised by how quickly I came to love Louie and how much I wanted the best for her. I actually cried from pride at one point in the book because she had achieved something wonderful and my heart just felt fit to burst. This book was just so lovely and entertaining! I really do recommend it especially for slightly younger than YA readers who are looking for a story about adventure and empowerment and friendship and bravery. P.S. Stay tuned for tomorrow's blog post which will be a guest post by Emma Carroll!